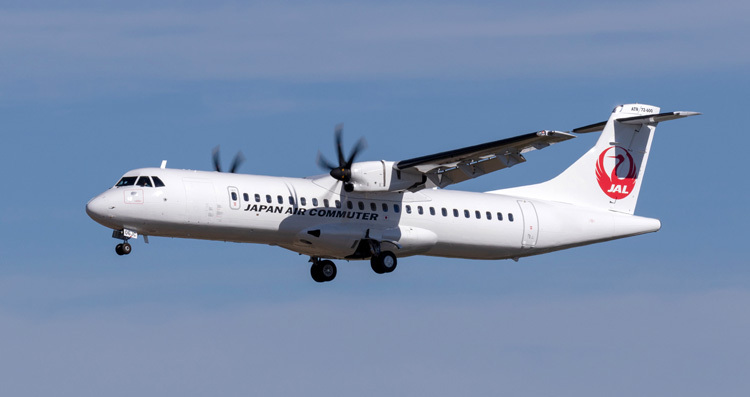 Japan Air Commuter Co. Ltd (JAC) today took delivery of its first ATR 72-600 following the conversion in June of one of its orders of an ATR 42-600 to its larger 72 version. The aircraft will have a 70-seat configuration. Hiroki Kato, President of Japan Air Commuter commented: "The performance of our existing ATR fleet has been highly satisfactory and this acquisition of an ATR 72-600 will allow us to be more flexible with our operations, matching capacity to demand more efficiently. The aircraft's blend of one of the most modern cabins in regional aviation with excellent economics allows us to deliver the high standards of comfort that our passengers expect." ATR Chief Executive Officer, Stefano Bortoli remarked: "Following the successful introduction of the ATR 42 in Japan last year there is no better proof of the quality of our aircraft than now seeing the ATR 72-600 ready to fly in Japan. Regional Aviation provides vital connectivity to countries all over the world, increasing tourism and boosting local economies. We look forward to our aircraft flying domestic and international passengers in Japan, for the major sporting events in the coming years and continuing to serve regional aviation in Japan further into the future." The first ATR 42-600 entered service with JAC in early 2017 and the up-gauging of this order reflects the -600's ability to effectively open and grow routes with the lowest possible risks, thanks to its 40% fuel burn advantage over its turboprop rival. The delivery of this larger aircraft allows JAC to fly more passengers to airports with shorter runways that are only accessible by turboprop. JAC have already taken delivery of five ATR 42-600 aircraft and they are going to introduce first ATR 72-600 in Japan with this delivery. With the delivery of the ATR 72-600 they will benefit from the commonality between the models. The ATR 42 and 72 share a Single Type Rating and 90% of spare parts. The versatility of the ATR -600 Series allows it to go where other aircraft simply cannot follow, performing a variety of operations with unbeatable economics.